QUEENS — In the 1980s and '90s Lance Feurtado and his brother Todd were members of the Seven Crowns, one of the biggest heroin and cocaine gangs in the country. At the time, South Jamaica and St. Albans, where rappers 50 Cent and Nicki Minaj grew up, were reeling from the crack epidemic, gangs and gun violence. In 1993 alone, 39 people were slain in the neighborhoods. But for the past 10 years, after serving decade-long prison sentences, the Feurtado brothers have been leaders of a group with a vastly different mission. Heading up the nonprofit King of Kings Foundation, they talk to teens in local schools, libraries and community centers about the dangers of joining gangs and using drugs. “We do everything with one sole purpose — to reduce shootings and killings in the area,” Lance Feurtado said. The Feurtados’ transformation is only one example of a series of dramatic and hard-fought changes that have been underway in the neighborhood, which has seen violent crime drop in recent years but it is still battling gangs and guns on a daily basis. NYPD statistics show a dramatic decrease in crime over the past two decades, similar to the rest of the city. Last year, there were 30 shootings in the 103rd Precinct, which covers Jamaica and Hollis, a decrease of more than 30 percent compared to the year before. The 113th Precinct, which covers South Jamaica and St. Albans, recorded a similar decline of about 30 percent, with 36 shootings. There were eight murders in the 103rd Precinct in 2013 compared to 10 in 2012, and seven murders in the 113th Precinct in 2013 compared to 16 in 2012. Those are the lowest levels since computerized police data were first recorded in the early 1990s. Major crime is also down sharply this year in both precincts — more than 25 percent in the 103rd Precinct and nearly 9 percent in the 113th. Police officials from each precinct said targeting gangs and illegal guns — two main factors behind violence in the area — contributed to the drop. Marmara said that in addition to the NYPD’s Gang Division, the 113th Precinct has also received help from a recently created unit assigned to the area about a year ago called SET (Strategy Enforcement Teams). Its primary task is to target youth gangs and crews, using tactics including monitoring their posts on social media. With the aid of additional officers from Operation Impact, which floods trouble spots with rookie police officers, and a Mobile Response Unit, which allows police officers to move around the area quickly, the precinct has been making progress. Periods without violent crimes can sometimes last for weeks, police officials said. “From October 29 till December 20 [last year] we had no shootings,” said Marmara, who remains cautiously optimistic, as overall crime in the precinct declined by 13.5 percent last year, compared to 2012. But the turn of events shouldn't be taken for granted, officials said. Major crime in the 113th Precinct decreased from 1993 to 2010 by 76 percent, only to rise again by 7 percent from 2009 to 2010. “We are making headway, but there is still a lot of work to do,” Marmara acknowledged. Last year, the precinct saw the second largest decrease in major crimes, but it still ranked No. 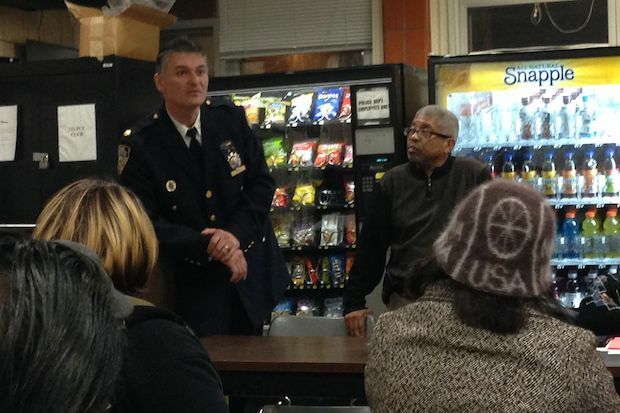 7 in overall crime citywide, Marmara said. Feurtado, the former gang member, estimates that there are at least 20 gangs and crews in South Jamaica, many of them affiliated with the Bloods and the Crips, as well as a number of Latino gangs, including the Latin Kings. Despite police efforts, easy access to firearms remains a problem, he said. “Guns are easily accessible,” Feurtado said, adding that there are also a lot of so-called "community guns" in the area that are shared by a number of people. “Tremendous amounts of guns are coming in from out of state,” said Inspector Charles McEvoy, commanding officer of the 103rd Precinct. He said his officers confiscate them “through search warrants, through concerned community members calling on somebody, tips to gun stoppers” — and they are making progress. Last year in the 103rd Precinct, 62 illegal guns were confiscated and 118 people were charged with illegal weapon possession in the area, compared to 57 illegal guns confiscated and 93 people charged the year before, McEvoy said. During the past two years, there have also been two gun buyback events in the community, organized by former Borough President Helen Marshall and the NYPD, during which more than 80 guns were surrendered. The Feurtado brothers said they believe their program called "snug" ("guns" spelled backwards), in which they use their “street cred” to mediate with fighting gangs, has also contributed to the decrease in the number of shootings in the area. The South Jamaica Cure Violence Program, founded by Erica Ford, does similar work. Karen Clements, editor at the local paper Communities of Color and a resident of Rochdale Village, agreed that the neighborhood continues to improve and that people feel safer. Local police and elected officials said they have worked for years to built trust between officers and residents. For about a decade, state Sen. Malcolm Smith has organized monthly meetings at his office, where residents meet with police officials and voice their concerns. Local Councilman Ruben Wills has also arranged similar public safety town halls since 2011 that usually take place in churches. Wills said that the meetings resulted in more than just positive interactions with law enforcement. Police have received important tips that led to actual investigations, he said. “The community is really engaged,” Clements explained. “People always call [to report a crime]." But state Sen. James Sanders, whose district includes South Jamaica, was less optimistic, saying that crime won't go away as long as the area struggles with a poor “economy and unemployment." “There is a need to create opportunity here, including vocational training,” he said.